Just for You by Jenn--Handcrafted Cards: Sharin' the Love...Smellin' the Sugar! WOW! We were told by our delivery service to stop hogging all the cupcakes for the district, so we only had 475 cupcakes on hand to deliver today! 100 of them went to the Forsyth Co. Senior Center, but the remainder of this first batch (there are still several hundred more to come next week!) 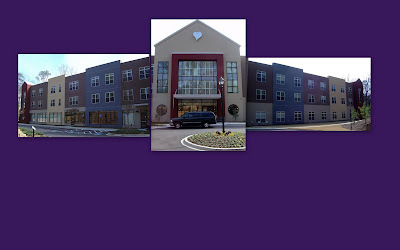 were split between the two Ronald McDonald Houses that serve Atlanta. My middle seats of my Suburban were folded down, and the back one was out, so we had boxes upon boxes of cupcakes filling the space. The aroma was heavenly! The first house is so easy to get to, and so welcoming! It has 11 rooms, and a huge common area with a large kitchen counter where we dropped off our cupcakes. We were told that the rooms are full at all times, a sad but true reality of the number of families in need of this kind of place. We left half our load there, and I didn't get a picture. I was trying to keep a stray cat from getting in the building! The second delivery was to the other House, which is about 10 miles away by Emory University. Oh. My. Word. My manager Kimmy and I were blown away as we turned into the drive and saw this building. It opened this past summer and has 50 double-occupancy rooms. It is state of the art and beyond words beautiful! It too is full to capacity at all times too, and we were assured by Kim, director of volunteer services, that the guests will make quick work of the over 100 cupcakes we dropped off. I did remember to snap a shot here. Since we have more coming next week, I'll get to return, and I'm so excited! Kim said we could have a tour, and I can't wait to see the rest of the facility. I asked Kim if there's a lead demonstrator for Stampin' Up! (we partner with RMHC to serve there as part of the company's vision of sharing what we love with others). It doesn't look like there is, so I'm thinking about applying for the position. This experience has just confirmed for me that volunteering is one of the most amazing things you can do with your time. If you don't volunteer regularly anywhere, I urge you to look around your community to find somewhere to invest. You'll be a different person for it, I promise! This is so cool. What a great way to reach out and do something for the families in these homes. Thanks for encouraging me to look into ways/areas to volunteer in my community.